If you decide to go with us you will receive a $10 credit towards your order. 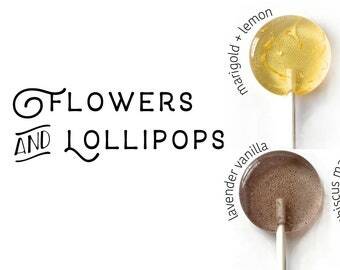 All lollipops are made to order just for you! 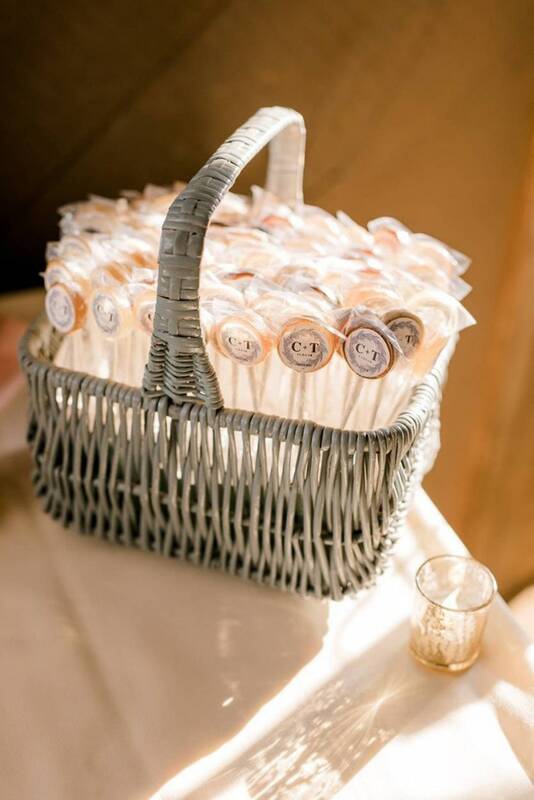 Please let us know if your order is for a wedding or special event ( and date of event ) so we may schedule your order with the freshest lollipops possible. Current production time is 8 - 10 business days before your order ships. 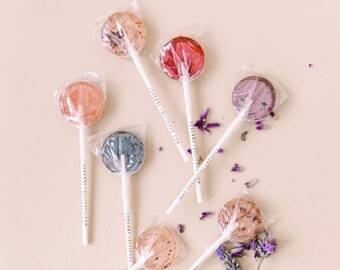 ★ You will receive 10 lollipops per order. ★ Each lollipop is individually wrapped and comes with our signature lollipop stick. ★ Each lollipop measures 1.4” wide by 1/2” thick and comes on a 4 1/2” stick. 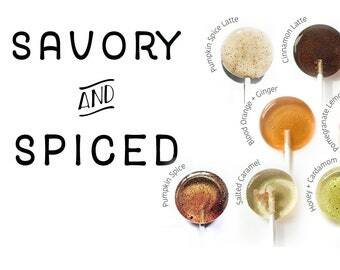 ★ Our basic labels are bright and play off the color of the lollipop or feature a watercolor design to match the flavor. Each showing the flavor in an easy to read typeface. ★ We will send along some samples of our custom labels as well. We work in an industrial kitchen that comes in contact with nuts, coconut, honey, spices. Please use discretion when ordering. So tasty! 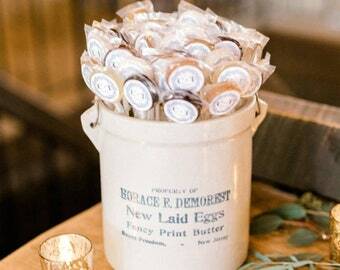 Can't wait to order our wedding favors! All payments are taken via Etsy Checkout. Custom order payments are due at least 2 weeks before shipment. If you are not happy with your order for any reason please just convo us and we will gladly work with you. Custom orders there will be a 20% non-refundable fee after production has started. Orders are sent USPS priority mail / first class with tracking. All wedding and large orders are sent USPS priority mail with tracking and insurance. At this time, we do not ship internationally. All items are prepared in compliance with Georgia State Health Department Regulations in our share kitchens. We are also serve safe certified. We LOVE custom orders! Just let us know what you had in mind and we will come up with something wonderful together. Our Lollipops measure 1.4 inches wide and are a healthy 1/2 inch thick. Our Original Hearts measure 1 1/2 inches wide and are just under 1/2 inch thick. All our lollipops come on a 5 1/2 inch stick. 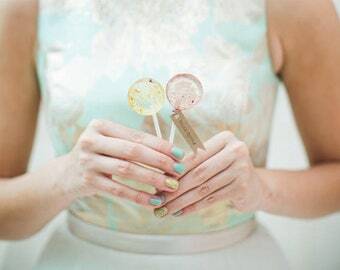 Our lollipops are made to order just for you! We don't add any extra preservatives other than what happens naturally. Storing in a ziploc bag away from heat, water, fans. Lollipops should be enjoyed within the first two weeks after receiving.